The Genomatix Mapper algorithm provides fast mapping and analysis of sequences from all established NGS Systems (sequence reads) to genomic or transcriptome target sequences. The analysis results can then be used for transcript expression analysis, discovery of splicing events, SNP detection, Small InDel detection, CNV detection, Structural Variant detection, Gene fusion detection and small RNA detection. The underlying annotation is derived from the Genomatix ElDorado genome annotation system. The algorithm uses a library of the target sequences which is stored in main memory for fast access. Mapping of a sequence read to target sequences with the Genomatix Mapper involves two steps. In the first step, seeds for potential mapping positions in the target sequence are identified via a mapping library (see below). In the second step, alignments of the complete sequence read to the previously identified positions in the target sequences are calculated. Results are ranked by their alignment score. The mapping library is based on shortest unique subsequences (SUS). A SUS for a position p in the target sequence is defined as the smallest downstream word starting at position p which occurs only once in all target sequences. Thus, each position in the target sequences can be uniquely defined via a SUS and vice versa. The figure below shows the coverage of positions in the human genome against the SUS length. Over 80% of all positions in the human genome are covered by SUS with <= 25 bps length. Coverage of the human genome sequence against the length of the shortest unique words. The mapping library contains sequences of maximum 25 bps. If a position in the target sequence is defined by a SUS which is longer than 25 bps, then only the first 25 bps of the SUS will be stored in the library. If these (non unique) 25 bps occur less than 50 times in the target sequences, all positions will be stored. If it occurs more than 50 times, it will be stored without position coordinates but with an ambiguous flag. The fast mode searches for exact hits of SUS in the sequence read, while the deep mode searches for SUS hits with up to one error tolerance. The error tolerance is determined via the chosen alignment (see below). If an alignment is done without insertions/deletions, all seeds will be searched which fit to the sequence read with up to one point mutation, while in case of mapping with insertion/deletions a search for seeds which map with up to one insertion or one deletion will be included. If the user wants to map sequence reads with insertions and deletions, the alignment of the complete source sequence to the target sequence is computed using the Needleman-Wunsch algorithm. Otherwise the alignment is based on pair wise comparison of nucleotides without consideration of insertions or deletions. Bisulfite sequencing uses bisulfite treatment to determine the methylation pattern of the DNA. Bisulfite treatment changes C to T in case of non-methylation while methylated C remains as C. The challenge in mapping bisulfite treated sequences is the ambiguity of "T" in a sequence read which can be either a "C" or a "T". Mapping of bisulfite data is done via an adaption of the seed search and the alignment strategy which consider the ambiguity of "T". All libraries remain unchanged. For paired end or mate pair sequencing data the mapper first estimates the expected distance range and strand orientation of the pairs by mapping a sample set of up to 1 million sequence reads. Based on the estimated distance and strand orientation the following algorithm is applied for mapping paired end data: If reads of a sequence pair could be mapped to multiple positions on the target sequence, all resulting read pair positions are checked if they fulfill the distance/strand orientation criteria. From those that do the pair with the best alignment criteria of each sequence is chosen as the final mapping result for this sequence pair. Otherwise the pair with the overall best alignment quality is chosen. Distances given in the resulting BAM file are the outer distances of mapped mate pairs (i.e. 5'-end of the first mate to 3'-end of the second mate). If small RNA sequencing data are mapped to the small RNA library, no linker removal is needed. This speciality is due to the fact that the smallRNA library is constructed in such a way that only the overlaps of the sequence reads with the small RNA is taken into consideration. Two approaches for spliced alignments are available: A local approach and a global approach. Local spliced alignment is based on the Genomatix ExonMapper algorithm. This algorithm discovers exon-intron structures including splice site detection in a window of 1 million base pairs via mapping of RNA sequences to genomic sequences. To detect anchors for a proper discovery of exon-intron structures a significant overlap of a sequence read with two neighbored exons is required. Thus the results will improve with the length of the sequence reads. The method is less sensitive compared to mapping against the splice junction library but will be able to annotate splicing events which are not yet known from the available annotations. Local spliced alignment is able to discover an arbitrary number of splice events from a sequence. Thus a typical application example is mapping of transcripts of any length to the genome. 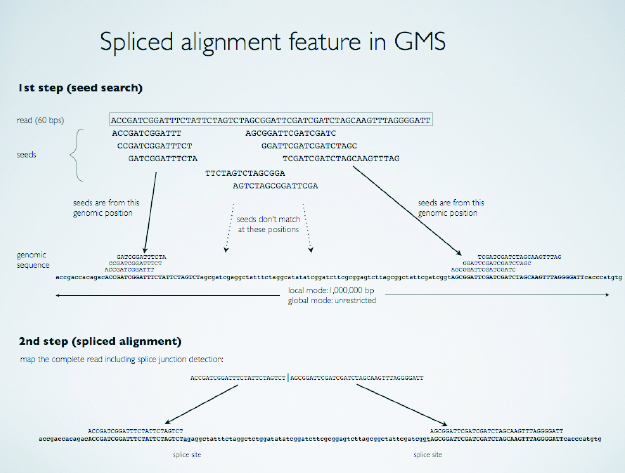 Global spliced alignment searches for splice events in a genome wide manner. Exons are identified via unique seed sequences from the mapping library. In contrast to the local spliced alignment, every exon must contain at least one unique seed sequence from the mapping library. Global spliced alignment is therefore not as sensitive as the local spliced alignment or mapping against splice library but identifies genome wide spliced alignments. A typical application of global spliced alignment is the detection of gene fusions or structural variants. De novo splice junction detection is done in two steps: read mapping and a subsequent run of spliced alignment can identify these previously unknown features. Please see the the parameter section of the Mapping help page for detais on the options for starting the Genomatix Mapper. Generally, a BAM file is created during a succesfull mapping run, which either contains the uniquely mapped hits (parameter 'report unique') or all input reads, regardless of their mapping status (parameter 'report all'). The unique hit percentage of over 50% is an indicator for good data quality. Summarizes the parameters, software versions, input sequence directory and result directory. Summarizes the number of unique best hits, the number of hits which occur several times with equal best quality (multiple hits) and the mapping quality. In case of mapping to the small RNA library, this file will also contain information about the number of unique - and multiple hits to the different small RNA classes. The paired-end statistics file contains information about the distance distribution between read pairs, the strand orientation of the aligned read pairs and the pileup size distribution. Min: Minimum distance between read pairs. Q1: First quantile of the distances between read pairs. Median: Median of the distances between read pairs. Q3: Third quantile of the distances between read pairs. Max: Maximum distance between read pairs. For RNA-Seq data, distances >= 1,000 are not used for the distribution, for DNA-Seq data the maximum is 10,000. Mean: Mean distance between read pairs. 1sigma, 2sigma, 3sigma: Values for the 1-fold, 2-fold and 3-fold standard deviation of the read pair distance distribution plus (in parentheses) the percentage of reads contained in each interval (mean ±1sigma, etc.). These values give you some more insight into the shape of your distribution without having to plot it. 0.05-, 0.10-, 0.90-, 0.95-Quantile: 0.05, 0.10, 0.90 and 0.95-quantiles of the insert size distribution. If the distances between read pairs do not indicate a normal distribution, we recommend to use these values as maximum deviation from mean distance between read pairs for the Gene Fusion and Structural Variant detection softwares. Number of read pairs used for this calculation: Maximum number of used read pairs is 150,000,000. ++: Number of read pairs where both mates map to the + strand. +-: Number of read pairs where the first mate maps to the + strand and the other to the - strand. -+: Number of read pairs where the first mate maps to the - strand and the other to the + strand. --: Number of read pairs where both mates map to the - strand. 0.95-Quantile pileup size: Maximum pileup size. This number defines the threshold for sequence redundancy where 95% of all aligned reads were found. This file contains a table which summarizes the mapping coordinates of all sequence reads which could be mapped uniquely with a best quality to the target sequences. Second best alignment Number of point mutations, insertions, deletion and aligned nucleotides of the second best alignment. Alignment quality (second best hit) Alignment quality of the second best hit. This file contains a table which summarizes the mapping coordinates of all sequence reads which could be mapped to several positions in the target sequences with the equal best quality. The file will only be created if the parameter for calculation of multiple mappings is set to Y. The structure of the table for the different target sequences is identical to the tables described in 20_Unique_Hit_Coordinates above. This file lists all transcripts (sorted alphabetically by accession number) together with the information if they are covered by unique or multiple hits. The number of unique/multiple hits together with the normalized expression value (NE) if given. # Symbol   GeneId  Accession number   unique reads    NE (unique)  multiple reads  NE (multiple)   features unique hit? This file contains all positions in the reference genome with a cytosine nucleotide which are covered by at least one bisulfite sequencing read. For each of these positions, the coverage, number of observed methylation and non-methylations are reported. This file contains all positions in the reference genome with a cytosine nucleotide which are covered by at least one bisulfite sequencing read and which are located within annotated promoters. For each of these positions, the promoter identifier, the coverage, number of observed methylation and non-methylations are reported. Bed files of reference sequence coordinates of methylated CGs according to mapping of a bisulfite sequencing. The number of occurrences for each region indicates the coverage. This file can be used to visualize methylated CG coverage e.g. in the Genome Browser of the Genomatix Genome Analyzer.